Horses are here to support our journey and assist us with moving towards a higher understanding and appreciation of life. 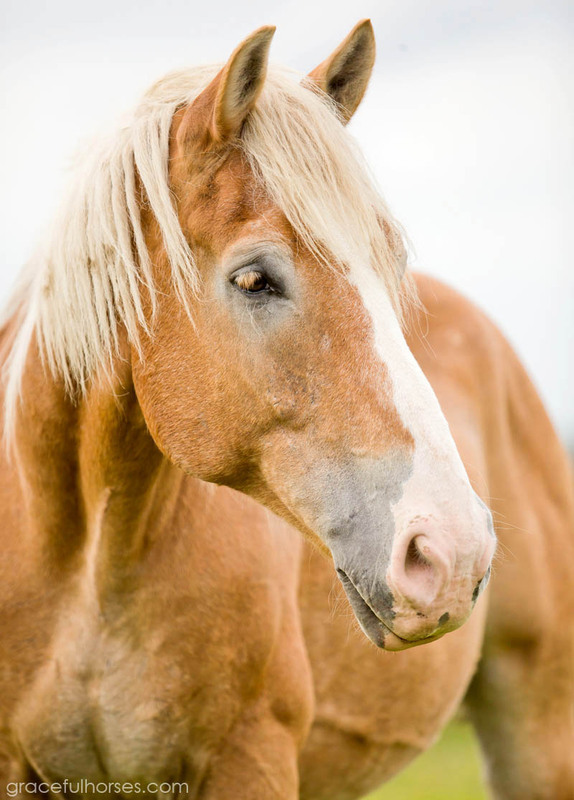 For the most part loved and well cared for, horses still endure a cruel fate sometimes. They can end up abandoned, sent into merciless auctions and sold to meat buyers. While we may not be able to fully stop all of this, we can surely make it better. One saved horse at a time. This is the story of Barney, an admirable Belgian whose life was changed through the transformative power of love. He has touched many human hearts with his grace, sensitivity and compassion offered in spite of everything he has been through. In 2014, I learned about Christine and Howie Welch and their wonderful work at the ‘Freedom Valley Horse Rescue’ in Omemee, ON. I decided to help whichever way I could, so I visited and photographed all their rescue horses, hoping to assist with their adoption. This is how I met Barney. A herd leader at the time, he had been with the rescue for a bit over a year. “I was told that Barney’s previous owners used him in competitive pulls but he was really lacking the spark that was required”, Christine Welch recalls. Not suited for an activity foreign to his temperament, Barney ended up living in a stall with no pasture, as his owners decided to rent their land to cash croppers. After a while, Barney was shipped to the Woodville auction. The Welches visit this auction regularly. So they did two years ago, one August day. With a soft spot for Belgians, Christine noticed Barney easily, his size made him stand out, as emaciated as he was. Despite the harsh auction environment, he was still able to enjoy interacting with a group of children who happened to be around (Barney’s adoration of children was going to fully blossom months later, when everything came full circle). “When I first saw Barney at the auction, he was covered with kids! I did not have to think twice, I immediately knew that I would keep this big sweetie safe” says Christine. “He was in such poor shape and had very little muscle tone”. She remembers the moment Barney arrived at the rescue and seemed to be overwhelmed by the access to so much pasture, grass, other horses and most importantly, love. He had not been used to any of this. Christine had to work hard to help Barney put some weight on. With his body still stiff and sore after years of pulling and stall confinement, it took this beautiful horse a while to get his muscles used to carrying him around. All of a sudden, he had so much space to cover! “It was not long before I felt that I did not want to part with Barney. But a year later, I began to realize that I really was not able to give him all of the attention he deserved. I was too busy tending to other rescue horses plus my own”. Christine decided to find a new home for Barney. 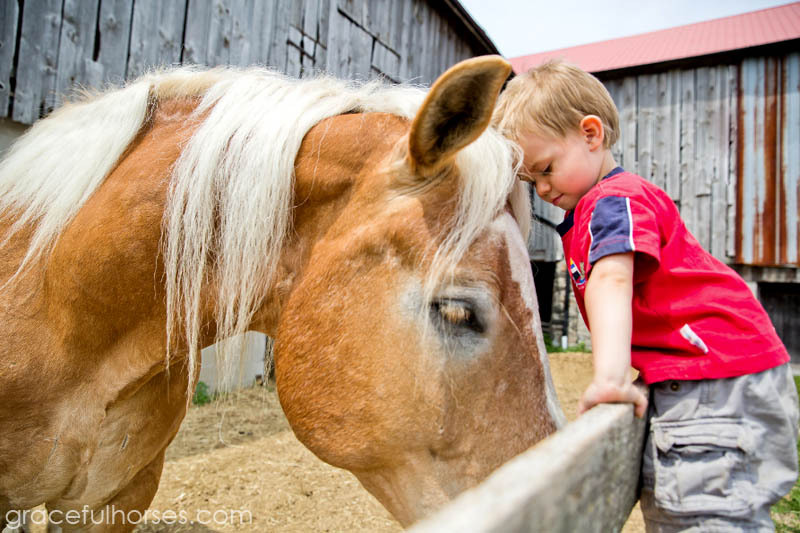 In November 2014, Barney was adopted by Cheri Davidson, owner of ‘Horse Discovery’ near Millbrook ON, a registered FEEL (Equine Facilitated Experiential Learning) practice. 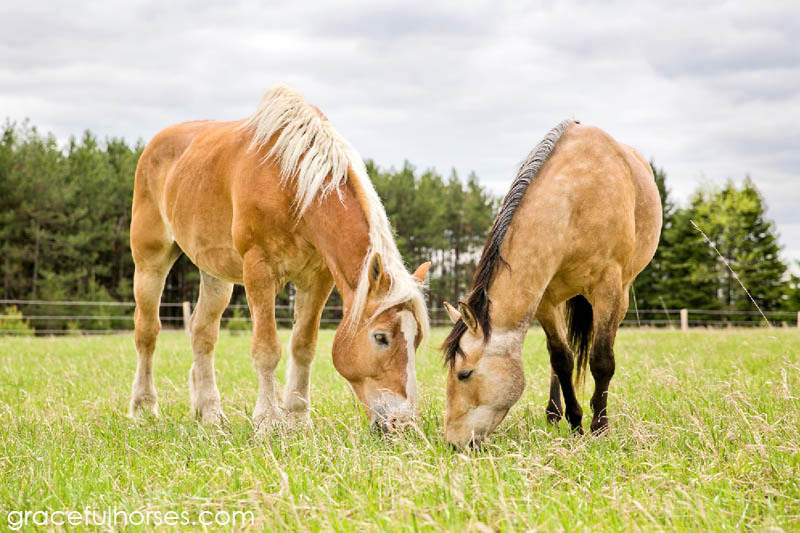 FEEL is a leading edge modality which involves horses’ willing participation as partners in assisting humans discover their potential and growth. 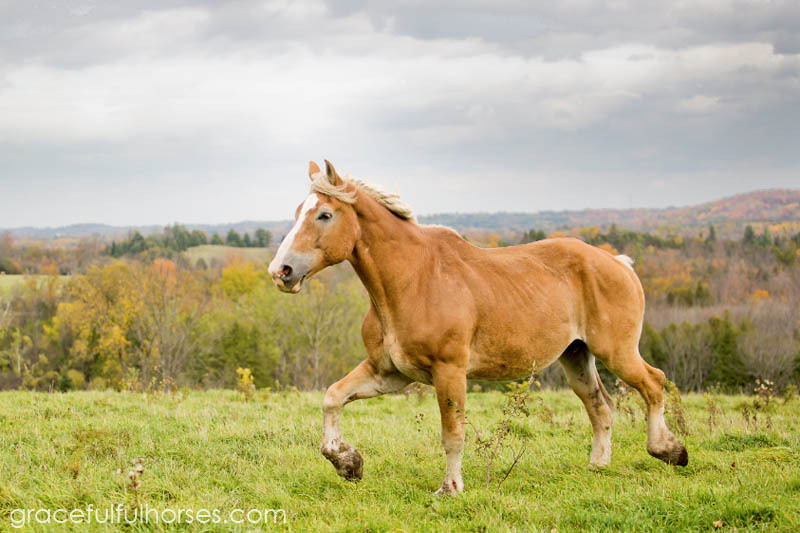 While researching rescues in her area, Cheri stumbled upon the portraits of horses available for adoption that I took at “Freedom Valley” and Barney caught her eye. Something clicked inside of her.“I met Barney on a very cold November day. I brought our two boys with me, ages two and six. After stepping inside the paddock, what struck me was that Barney never took his eyes off the boys. He bent down to sniff their hats and was so interested in them. I knew right away that he was meant to join our family”, recalls Cheri. But it had not been the easiest new journey for Barney. He seemed to take the transition the hard way and he could not integrate. His position was unclear: from herd leader, a role earned and maintained amongst his previous rescue buddies, he found himself at the bottom of the peck order. He was not connecting with his new owners and his health started to deteriorate. “During the weeks and months following Barney’s arrival at our farm, I was reminded of the complexity and depth of emotions horses experience” says Cheri. Worried and wanting to support Barney’s healing but not getting any results from traditional approaches, Cheri decided to try a new avenue: she brought in Janet Hogeboom, a certified Emotion Code practitioner. Through a series of sessions, Janet identified and helped Barney release negative emotions such as panic, confusion and abandonment he had been carrying in his body, affecting his connection to the world. “I noticed an immediate difference: Barney began to look me in the eye, the sadness lifted, he started to engage with me and enjoy being groomed. We finally connected and it felt amazing to receive his huge heart energy!”, remembers Cheri. In May, I went to visit Barney at his new home. 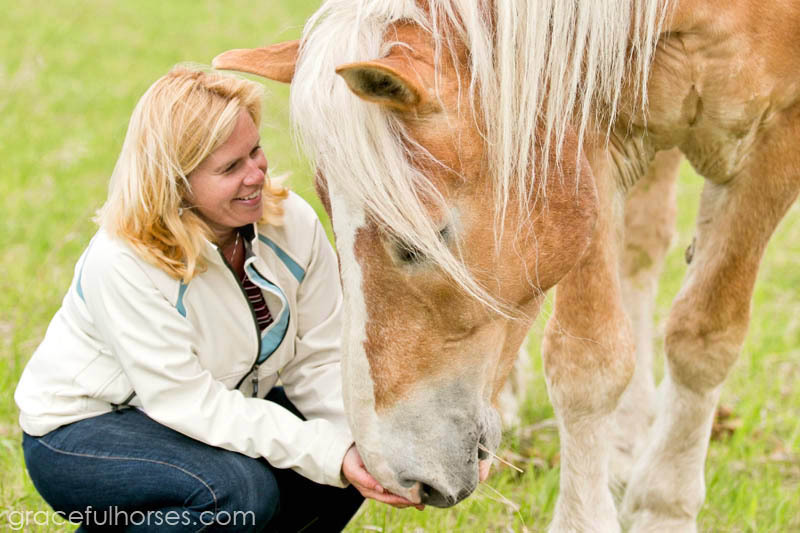 I had not been with horses for a while and I was, at the time, feeling uncertain about a couple of areas in my life. My spirit was uplifted and I felt deeply reassured. More so, I reconnected with a deep part within myself, which further allowed for more inspiration to come through in my work. One brief moment with Barney also made me realize how I am supposed to feel in my life in general, never fear and doubt that I am always supported and safe, no matter what. Cheri recalls: “I held my breath that Barney might choose to work with Manuela, as so far he had been reluctant to approach visitors and to do any FEEL work. On that day, however, he stepped right up to her as if to say “I’m ready, I’m here for you.” The two of them sat in peace, in their own little world, for quite a long time. It was beautiful to see and brought tears to my eyes”. As far as I am concerned, Barney is a healer. A wounded one, whose difficulties have only increased his levels of sensitivity and compassion, only to make him better suited for a beautiful purpose. Barney will continue on helping a lot of human hearts expand. Cheri’s two boys have a special connection with Barney. I have witnessed their interaction and Barney’s eyes soften and almost smile each time. Their pure spirits see each other. My personal thanks go to all those who make a difference in the world. Every small loving gesture counts. One blessing at a time, my hope is that we will all share a Planet which will have found its way to a healed place. 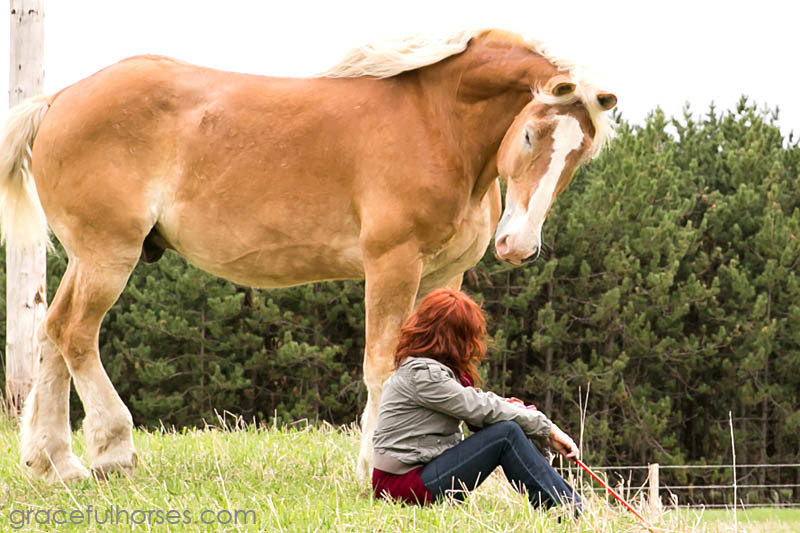 What a beautiful horse….. beautiful people and a beautiful story. To think the world often throws away these “wounded healers”. Thank you Manuela for your heart and your work in this area. Manuela – This story of Barney captures it all. It was the beginning of our beautiful friendship, your evolution in the healing arts, and many other adventures to come! It is my pleasure to have him as part of our FEEL family. He has continued to help others grow and heal in his special way.